Fruit and vegetable production on plastic mulch is a substantial investment. To help justify the high input cost, farmers oftentimes choose to double crop. This practice can provide a significant amount of additional income for the farm if a good farm management plan is in place, there is a demand for the product, and the weather cooperates. Plastic mulch beds. Photo Credit: Blake Thaxton. Spring fruit and vegetable crops are usually grown on black plastic mulch, but fall crops are usually grown on white plastic. Black plastic mulch helps absorb heat to warm the soil in the late winter and spring. White plastic mulch helps reflect light to cool the soil in the late summer and fall. In order to reuse black plastic from the spring, painting the mulch is recommended. White interior latex paint can be diluted with water and sprayed on the plastic. At least one study has shown the ratio of paint to water can vary drastically without any significant difference in yield. Crop residue leftover from the spring crop should be removed to reduce the risk of plant and human pathogens and deter harboring of insect and rodent pests. If pests are an issue or a potential threat, then the soil can be fumigated before the second crop is planted. 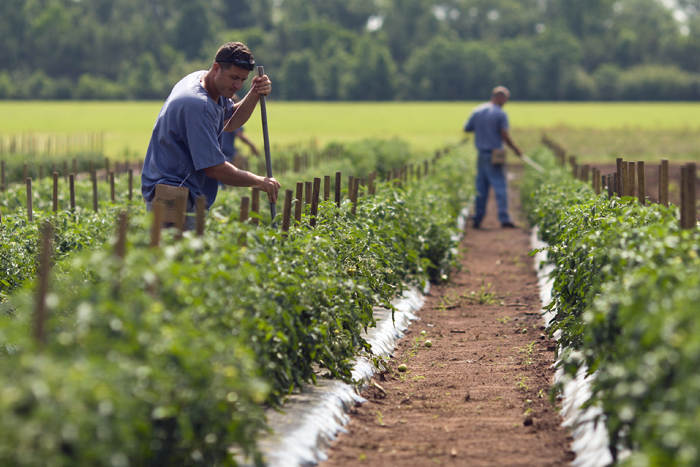 Also, it is important to continue to irrigate the beds during the time between the two crops. This will ensure a good water distribution throughout the bed when the second crop is planted. When double cropping, it is important to consider each crop’s fertilizer needs independently. Never assume that excess fertilizer from the spring crop will be taken up by the fall crop. Take a soil sample before the second crop is planted to determine nutrient deficiencies. If phosphorus is required for the second crop, then phosphoric acid can be injected through the drip. 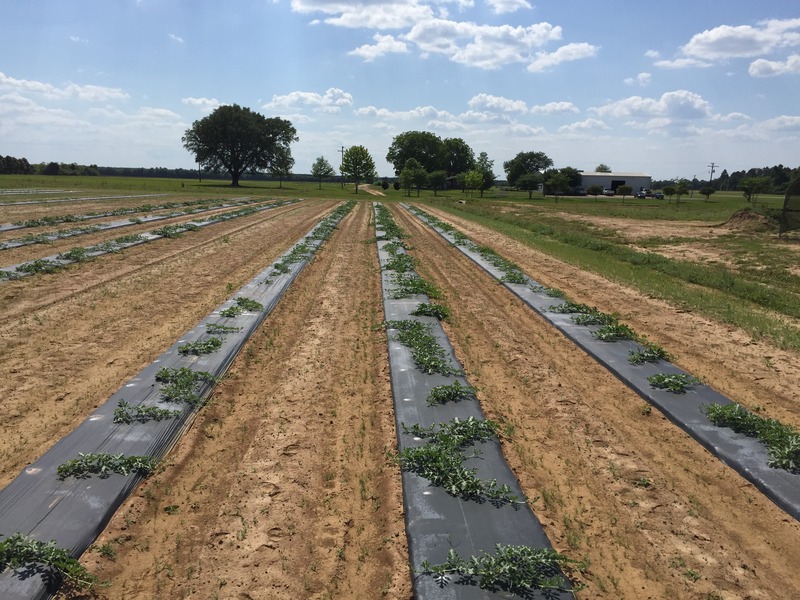 It is never a good idea to plant members of the same plant family sequentially, such as tomatoes after an eggplant crop, or zucchini after a watermelon crop. 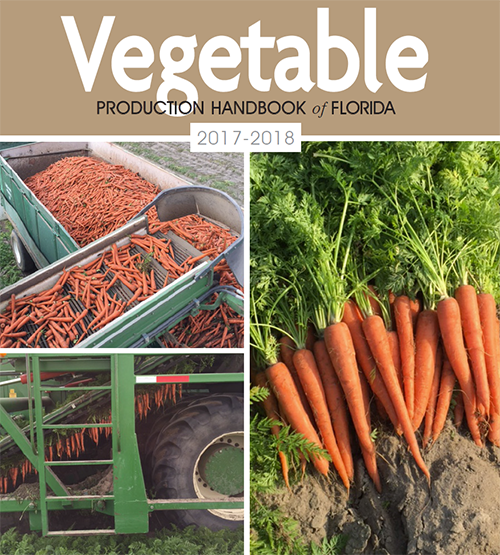 The Vegetable Production Handbook of Florida lists production practices for various crops by plant family. Recommended fall crops to follow tomatoes include: squash; broccoli; or cabbage. Recommended fall crops to follow watermelons and other cucurbits include: peppers; tomatoes; or broccoli. Consider plant spacing when selecting a second crop. Added holes in the plastic mulch will reduce it’s integrity and promote weed growth. No matter what crop you choose to plant this fall, make sure you have a good marketing plan in place, with your buyers already lined up. Matt Lollar is the Santa Rosa County Commercial Horticulture Agent.He began his Extension career in 2010 in Sanford, FL as the Seminole County Horticulture Agent.Matt is originally from Belle Fontaine, AL.He earned his MS and BS degrees in Horticulture Production from Auburn University.